Another proof ensi were door curtain. Look at the "rings" used to hang the rug. Those loops are for hanging the piece, but not necessarily over a doorway. They also look like they were added after the piece was taken off the loom, although it's hard to tell from the photos. I have had such pieces, Steve, and the braided loops were original to the piece. If, in fact, they were there originally to hang the ensi as a tent flap, I do not know. 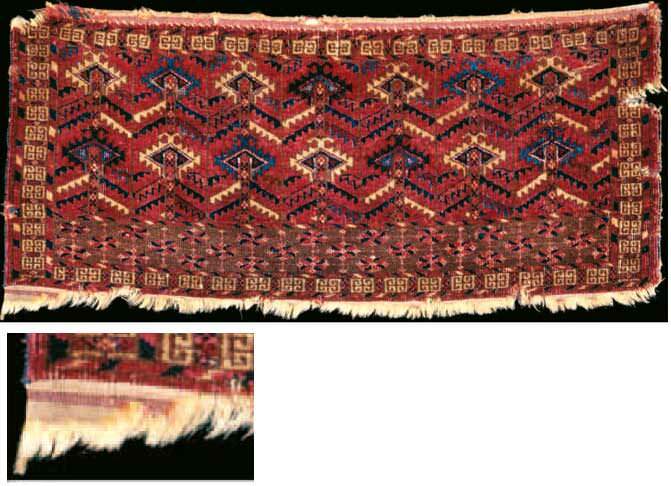 I've seen Turkmen pieces with braided rope sewn on (I have a few), and I'm sure I've seen some that were on them when they came off the loom. I can't tell from the photo which this one is, and I don't think it matters very much. That was an afterthought - the main point is that the existence of those ropes isn't evidence that it hung in front of a doorframe. Pictorial evidence is rare of ensis being used in situ, though a couple of etchings and photos show what may be "rugs" covering yurt entrances. Most of the pieces we have are rather short for an entrance, unless one stooped very, very low to enter. However, it is not unusual for doors to be quite short for the purpose of defense. I have seen doors about the height of ensis in some Russian buildings of a couple hundred years of age. The idea was that someone entering would be stooped over and defenseless. 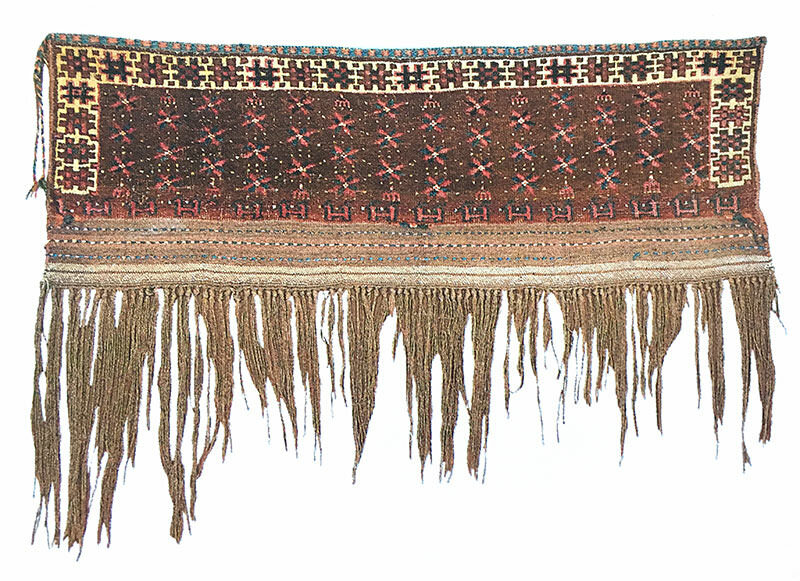 The most common assumption of today is that the vast majority of extant ensis were woven not for local use, but for sale once the railroads arrived in the late 19th century, opening markets for "tribal" goods to be shipped to metropolitan areas - exactly what occurred in the SW US with Navajo weavings around the same time frame. A curtain doesn't go necessarily to the floor. The yurt door was open and the ensi was unrolled from the top to decorate the entrance. 1. Turkmen people before the 20th century were probably much shorter than the typical person in the developed world today. In fact, most people were. 2. In addition to the widespread belief that ensis were doorway covers, there's a nearly equally widespread belief that the germetch covered the lower part of the doorway. I'm very skeptical about that one, since the few specimens that still have their fringe would have had a total height of nearly 3 feet, but it's worth mention. Its interesting subject wether or not the Ensis were door covers, I suppose we will never know for sure. I have looked into to into from time to time, and personally I think they were, probably only for special occasions, not everyday use. Looking at the photo taken by Prokudin-Gorsky around 1900 and the proportions of door and rug showing a known rather square type of late Tekke Ensi which surely wouldn't have been able to cover the door to the ground. There is easily, if not necesarrely, space for a Germech below it. I only have one possible Germech with fringes in my photo archive, its size is 30 x 86 cm, less than two feet in hight including fringes. And a format like that would actually make sense at the Prokudin-Gorsky yurt door. And Steve I am curious what other candidates for Germechs with fringes you have seen? They are often smaller in size than they appear in photos. When I remember I try to save all Germechs I see on the net, so I would be happy if you could post the ones with fringes you have seen, it is an interesting subject. I would love to see a higher resolution version of this photo. I suppose it is a Tekke yurt. Either it is a pile of rubbish in front of the door (not a very practical placement), or it could be a bit of rubbish to the right in the doorway - and a stick with a textile covering the lover part of the door, as the Germech is supposed to have. Last edited by Martin Andersen; March 20th, 2018 at 10:29 AM. Excellent! I had not been aware of the Produkin-Gorsky photo. 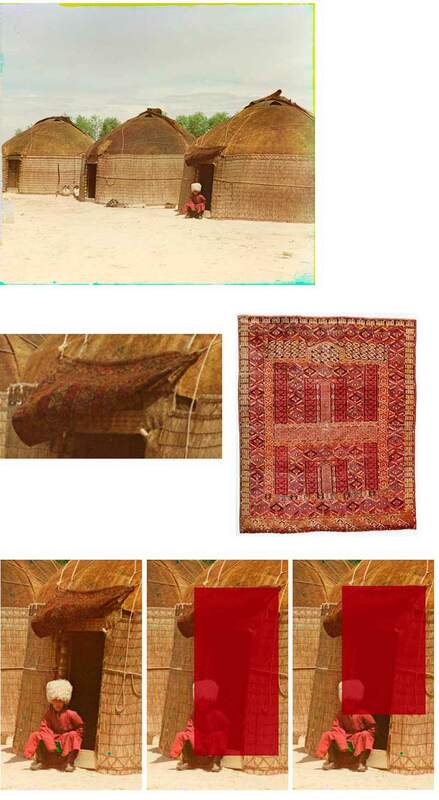 Who came up with the inset photo of the ensi that seems to match the yurt example rather closely? The treatment of the bird heads/candelabra in the center seems atypical enough to make the inset example a pretty good find for a researcher. 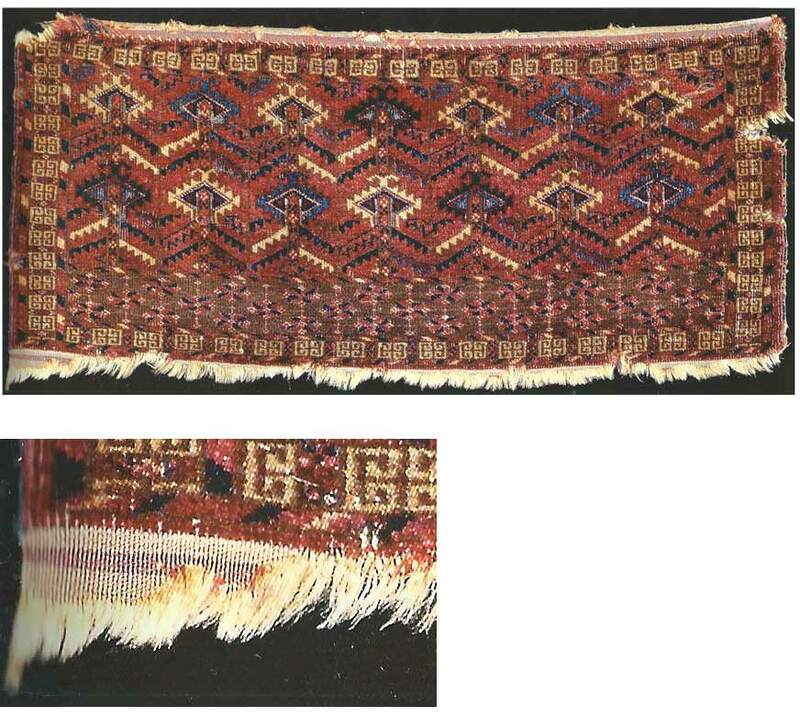 I find it somewhat surprising that the documentation of this use of the ensi (and other items) has proven to be as elusive as it has, given the relatively small gap of time between the period of 'full' tribal custom and the commencement of serious research into whole subject of utilitarian weaving among Turkoman peoples. One would think there were enough surviving subjects for interview by the time the Moshkovas, et al, had come along, that the point could have been pinned down confidently. 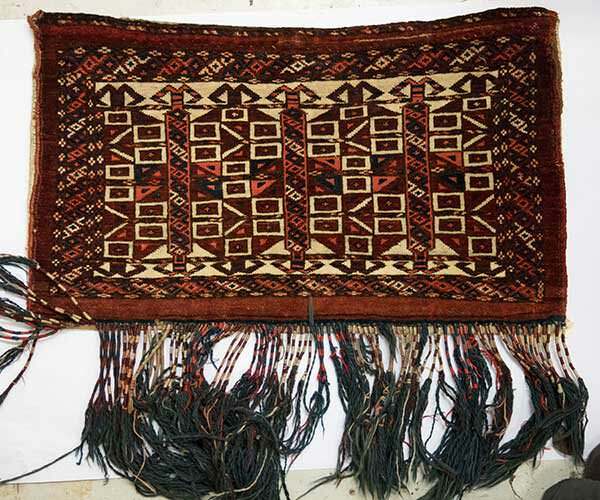 It seems clear that some time in the latter part of the 19th century, the idea took hold at least among some Turkoman weavers that the ensi might be a winner in the marketplace, giving rise to an explosion of production. (I have a couple myself!) It is often said that the 'really old' ones had design features like the one posted by Alain at the beginning of this thread, including well-spaced bird head figures relatively few in number that alternate in offset from one horizontal row to another, and certain size and proportion characteristics. 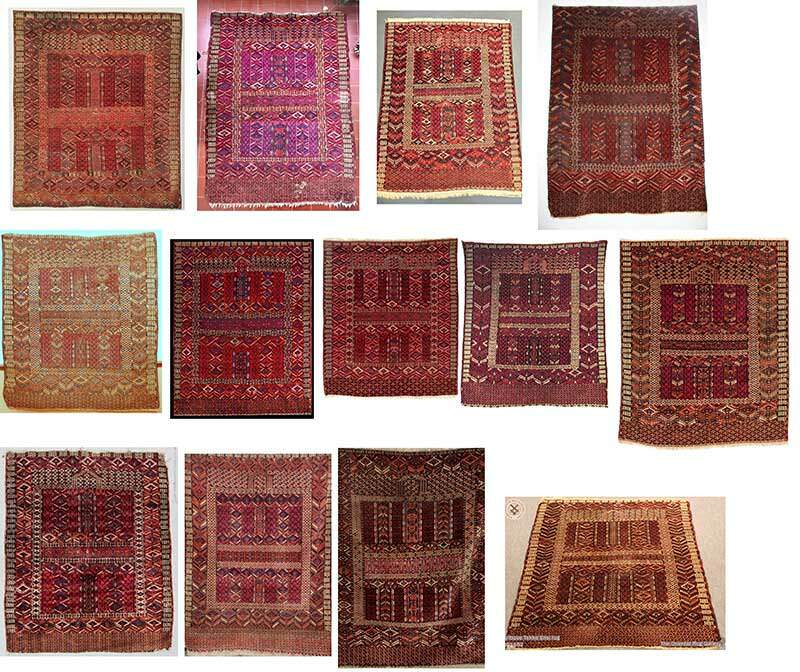 On the other hand, the later ones, presumably woven for sale/export in most cases, had more static designs with more detail packed into the whole scheme. 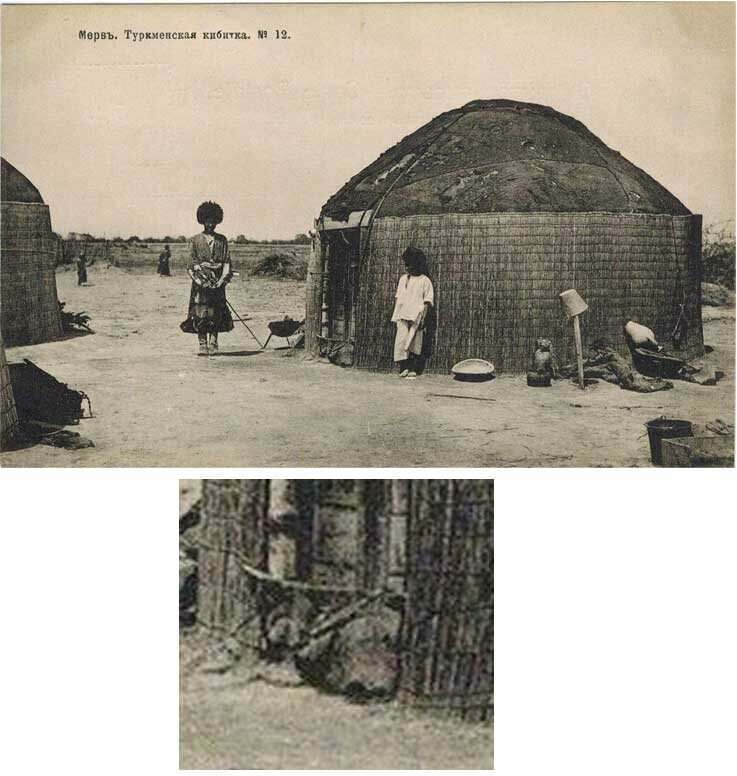 It is interesting to note that the yurt photographed by Produkin-Gorsky features one from the latter period of production, diligently fulfilling its duty right up there on the yurt! Is it possible that photo op was staged by the Tekke Marketing Department!?! It’s my impression that Prokudin-Gorsky for his time was a rather sober photographer, not heavily staging and romanticizing as some earlier photographers, to me it looks like he was simply trying to make a record of the different cultures of the Russian empire. But his photos are of course not photojournalism as we would see its today, and the photos are staged in the sense that his technique with 3 different glass plates for each photo (producing the fantastic colors) required his subjects to stand still for a rather long time. And Steve, I just took the measurements of the Germech in photoshop, if the width is 86 cm then I get the height including fringes to 62 cm, just a bit more than 2 feet (and not less, sorry). But of course no way of knowing if they have been longer originally. Last edited by Martin Andersen; March 20th, 2018 at 04:54 PM. Speaking of geniuses, I am thoroughly impressed with your collection of ensis that mimic the one in the photo. You are definitely my favorite speculator on any subject! Sorry if I am hijacking the thread to be about the Germech format instead of the Ensi, but I of course sees them as being an interesting pair. Last edited by Martin Andersen; March 20th, 2018 at 07:11 PM. 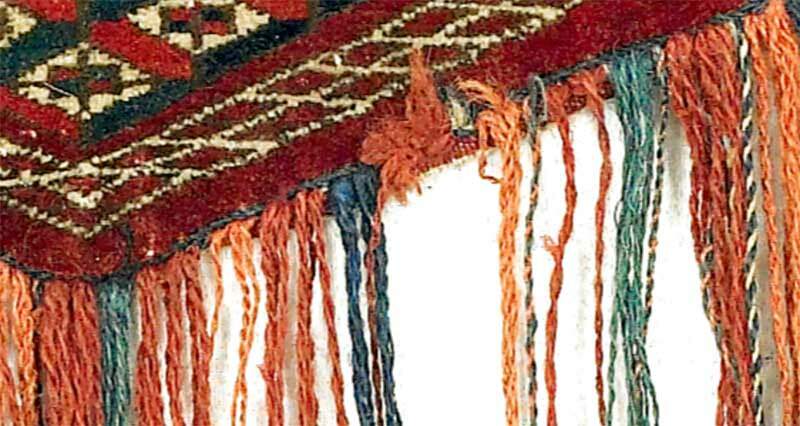 The fringes on the germetches you posted look like extensions of the warps, as are most of the fringes I've seen on Turkmen weavings. 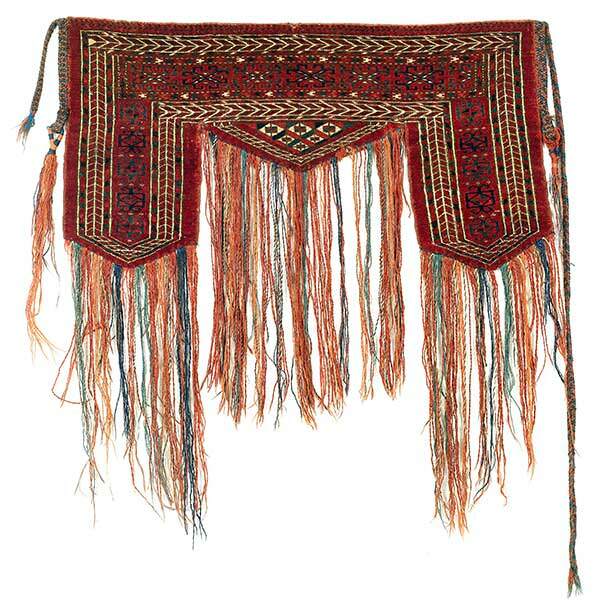 Sewn on fringes seem to be uncommon in Turkmen work. You point out that they probably weren't in place except on special occasions, when so the barrier they present wouldn't be an everyday obstacle. That was pointed out to me at the time I wrote the letter to HALI, too, and has merit. On the other hand, unless the yurt has indoor plumbing, it would be necessary to cross the threshold from time to time even on special occasions. If any 19th century travelers mentioned the germetsch it would make understanding its function much easier. 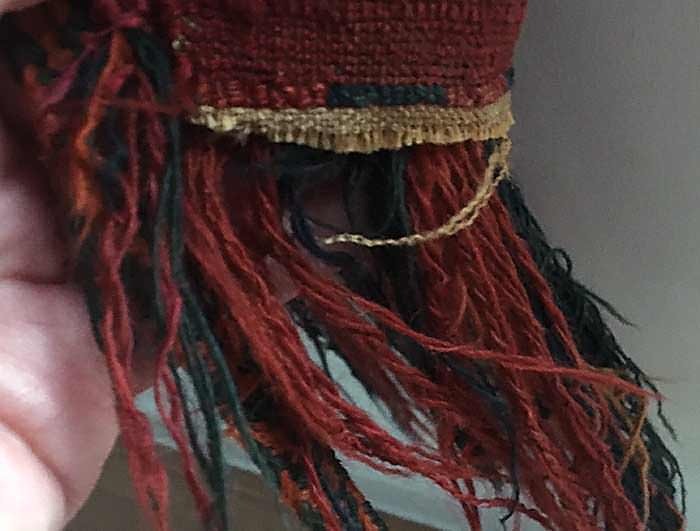 My gut feeling is that a long fringe that barely reaches the floor is an unlikely decorative or functional element, so I'm inclined to think it was a trapping for the interior of the yurt or for some animal. But it's hard to be confident in that belief. Most of the older yurt images show a wood threshold board that is at least 12 inches high at the bottom of the entryways. If the flatwoven portion was on the ground, then it's conceivable as an exterior cover. I am inclined to believe that it may have been used on the backside of the board, as a more pleasant - and insulating - interior facing cover. You're right, I was having a senior moment. The fringes are essentially a row of very long pile. It's neither sewn on nor is it extended warp. I think I'm lucid again. My apologies. In my photo archive I have a total of 22 possible Germechs. 16 of these still have the lower end flat weave (or reminiscenses of it) - and none of these 16 have any large colored "fringe knots"! That is rather extraordinary. 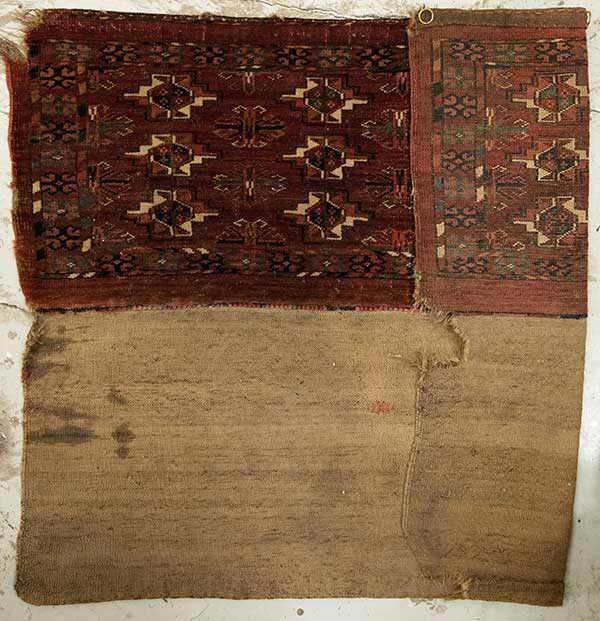 So at least concerning the Germechs I have seen this means one could argue that they as a format are peculiar in this, and differs from other bags and trappings in that they don’t have the large colored fringe-knots in the transition between pile weave and flat weave. 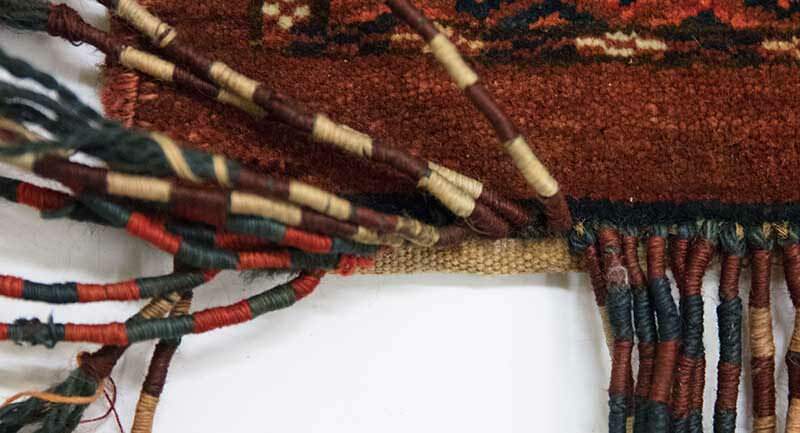 This as far as I can see means that they actually never had long colored decorative fringes, as opposed to other trappings and bags - perhaps exactly because they were intended to hang low. I know it's a rather convoluted argument, but I dont think it’s far out. Perhaps the lack of "fringe knots" in conjunction with size/design from the Ensis elem/ Ensi borders/and upper reenforcement is the definition of the Germech format? Well, I will keep on looking to see if this holds water, I of course as often before may be wrong. Last edited by Martin Andersen; March 21st, 2018 at 03:47 PM.